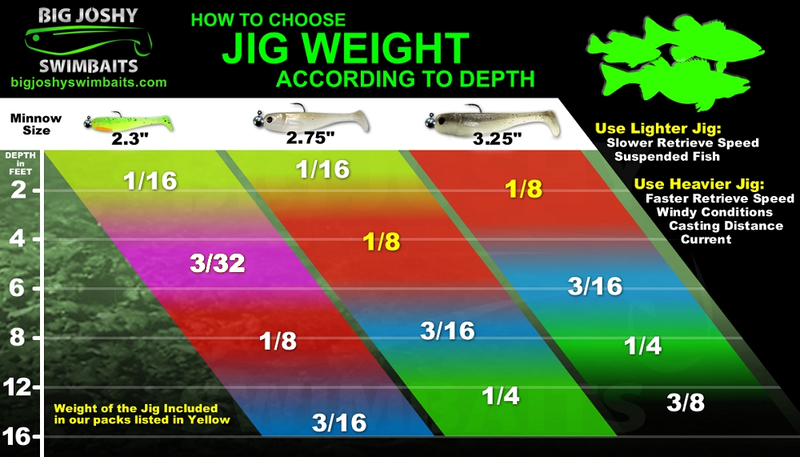 This custom size jig was created to fill the gap between 1/16 and 1/8oz. Custom Sizes perfect for the Big Joshy Minnows. I just discovered the Big Joshy brand last year at the Columbus Fishing expo and ever since have been throwing them as my go to swimbait. This winter was the first time I got to throw them in cold weather and the results have been surprising. Through the other seasons I have been catching bass after bass but when it turned cold I immediately started catching other species. First it was saugeye after saugeye, then came a stripper, and then out of nowhere a channel which I was told hardly ever bite on plastic. You make an excellent product and I will continually to buy and throw the Big Joshy brand!